Are you in pain, but your doc won’t increase your hydrocodone dosage (or you don’t want to overdose)? University of Texas at Arlington researchers may have a (future) drug-free fix: electrical stimulation of a deep middle-brain structure that blocks pain signals at the spinal cord level while triggering release of pleasure-associated dopamine to reduce the associated emotional distress. “This is the first study to use a wireless electrical device to alleviate pain by directly stimulating the ventral tegmental area of the brain,” said Yuan Bo Peng, UTA psychology professor and co-author of a paper in the journal Experimental Brain Research. “While still under laboratory testing [in rats], this new method does provide hope that in the future we will be able to alleviate chronic pain without the side effects of medications,” said Peng. Nearly two million Americans were dependent on or abused opioid medicines in 2014, and 165,000 died between 1999 and 2014 from overdoses related to opioid prescriptions, according to the Centers for Disease Control. The project was supported partly by grants from the Texas Norman Hackerman Advanced Research Program, Intel Corporation, and the Texas Medical Research Collaborative. Deep brain stimulation has been found to be effective in relieving intractable pain. 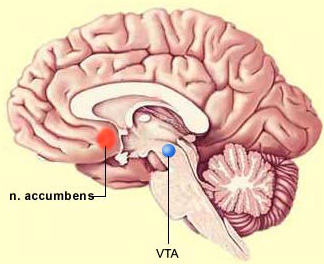 The ventral tegmental area (VTA) plays a role not only in the reward process, but also in the modulation of nociception. 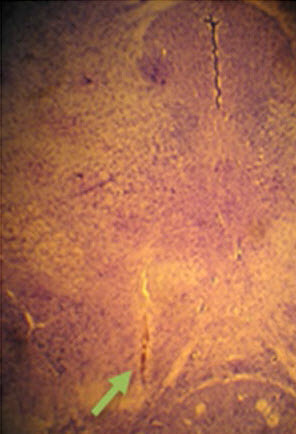 Lesions of VTA result in increased pain thresholds and exacerbate pain in several pain models. It is hypothesized that direct activation of VTA will reduce pain experience. In this study, we investigated the effect of direct electrical stimulation of the VTA on mechanical, thermal and carrageenan-induced chemical nociceptive thresholds in Sprague–Dawley rats using our custom-designed wireless stimulator. We found that: (1) VTA stimulation itself did not show any change in mechanical or thermal threshold; and (2) the decreased mechanical and thermal thresholds induced by carrageenan injection in the hind paw contralateral to the stimulation site were significantly reversed by VTA stimulation. To further explore the underlying mechanism of VTA stimulation-induced analgesia, spinal cord dorsal horn neuronal responses to graded mechanical stimuli were recorded. VTA stimulation significantly inhibited dorsal horn neuronal activity in response to pressure and pinch from the paw, but not brush. This indicated that VTA stimulation may have exerted its analgesic effect via descending modulatory pain pathways, possibly through its connections with brain stem structures and cerebral cortex areas.